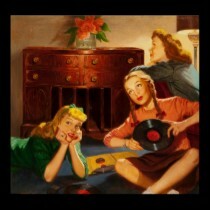 Here is a typical Yiddish song ("The Passover medley") by the fabulous Barry Sisters. The Barry Sisters were a Jewish pair that recorded hundreds of Yiddish songs. Originally known as the Bagelman Sisters, they were the most popular singers in the genre called Yiddish Swing, which popularized and jazzified Yiddish folk songs. They also sang popular tunes with Yiddish lyrics (e.g. "Raindrops Keep Falling on My Head"). 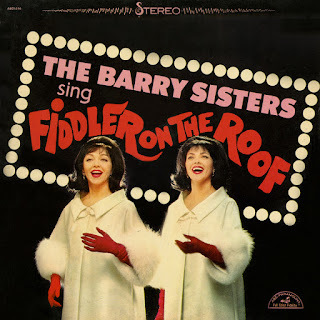 Let it not be forgotten that the Barry Sisters not only form an important link between the past and present of Yiddish song but moreover brought songs of Yiddish songwriters to a wider mainstream audience than probably anybody before. Their tremendous abilities -- as international pop singers, a hugely successful sister act, and two fun, charming beauties -- quickly led to international stardom. Their career spanned close on half a century, from the post-depression years to the 1970's. 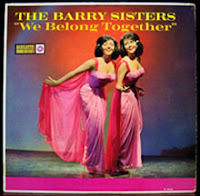 The Barry repertoire included songs in nine languages. They were often featured on the New York radio show "Yiddish Melodies in Swing" and also crossed over into the mainstream as well, appearing on American TV programs such as "The Ed Sullivan Show" (10 times, from 1956 to 1965), "The Jack Paar's Show" and "The Tonight Show", in addition to being mainstays at top nightspots in several countries. They also were among the few performers to tour the former Soviet Union, and came to have a large following from that country, as well many other places in the world. Claire, with the higher voice, is still active and performing. 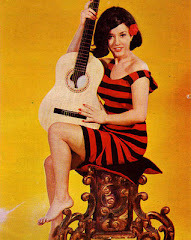 Her sister Myrna, with the lower voice, passed away quite a few years ago. Enjoy the rich voice and the good humour of the Barry Sisters!